Oilers sign prospect Ethan Bear to three-year contract. 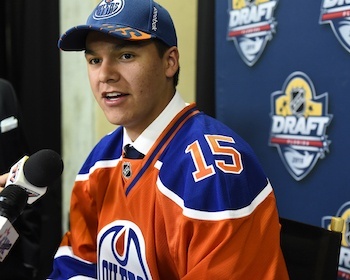 Ethan Bear is still considered an Edmonton Oilers’ prospect, but the 19-year-old defenceman from Saskatchewan’s Ochapowace Nation now has even better odds of eventually becoming a professional hockey player. That’s because the Oilers signed Bear, who is Cree, to a three-year contract earlier this month. Edmonton had selected Bear in the fifth round, 124th over-all, at the 2015 National Hockey League’s Entry Draft. Bear has spent the past three seasons toiling in the Western Hockey League with the Seattle Thunderbirds, who are based in the state of Washington. Despite signing a pro contract, Bear still has some junior eligibility remaining. Thus he could return to the Thunderbirds not only for the upcoming 2016-17 season but for one more year after that should Seattle decide to keep him as one of their overage players. Bear said the Oilers’ brass has not officially told him he will be returning to the Thunderbirds for another year of grooming. “They’ve sugar-coated it,” he said of the team’s plans for him. And Bear doesn’t seem to mind if he has to ride the buses in the junior ranks for at least another season. Bear, however, made tremendous strides during the 2015-16 season. The Oilers had drafted him following his sophomore season in Seattle primarily because of his defensive play. He had chipped in with 38 points, including 13 goals, in 69 regular season contests during the 2014-15 season. Besides continuing to excel defensively this past season, Bear also considerably improved his offensive production. He racked up 65 points (19 goals and 46 assists) in 69 regular season games. And he then averaged more than a point per outing in the playoffs, earning 22 points, including eight goals, in 18 matches. Bear’s efforts helped Seattle advance to the WHL championship series. The Thunderbirds, however, were downed 4-1 in that best-of-seven series against the Brandon Wheat Kings. Bear is not sure whether the Thunderbirds’ extended playoff run contributed to the fact he was offered a deal from the Edmonton organization. A year ago the Thunderbirds had placed fifth in the over-all standings during regular season action in the 22-team WHL. Thus some were surprised the club advanced to the league’s championship series. If he does indeed return to Seattle for another season as expected, Bear said it’s too early to speculate how the Thunderbirds will fare this coming year. As for Bear, he was considered one of the veterans at the Oilers’ developmental camp held earlier this month in Jasper, Alta. He also took part in the 2015 camp, mere days after becoming an Edmonton draftee. Bear’s off-season has also included spending some time back on the Ochapowace Nation as well as training in Regina, located about an hour from his home. Bear is hoping to continue to impress those in the Oilers’ organization during a four-team tournament that will be staged Sept. 16 to Sept. 19 in Penticton, B.C. Besides Edmonton, the Vancouver Canucks, Calgary Flames and Winnipeg Jets will also be icing teams at this tourney, which will primarily feature NHL prospects from each franchise. Following that, Bear is expected to be invited to the Oilers’ main training camp in late September. Last year he spent four days at the main camp before being returned to the Thunderbirds. He’s hoping to stick around quite a bit longer this time around. And he’s also hoping he gets the opportunity to suit up for at least one of the Oilers’ pre-season contests, something he did not get a chance to do a year ago. “That’s my goal,” he said of donning an Edmonton jersey and playing in an exhibition match.